OOH!!! that is so exciting you won Katie!!!! Now that you're the cat Ruler of the World can I ask for a favor? Ever since they snipped me, I've been missing my jewels A LOT!!! Could you do something so I can get them back! Pretty please!!! Congratulations Queen Katie. I'm glad the blind kitties will get all the food. I'm glad all of the shelters will get food. OMC Katie and Glogirly & Blind Cat Rescue! Concatulations! I also salute the other cat-idates for their creative, honest campaigns! You don't see that anymore. Your chosen shelters are so worthy and I'm happy they too will receive 1,000 meals. Katie--I see you found the perfect PINK tiara! CONCATULATIONS!!! We knew you could do it! Congratulations on winning. We think all of the candidates were winners and appreciate the work they (and you) are doing. Congratulations on your win on behalf of the kitties at Blind Cat Rescue! Oh congratulations!!! you look lovely in your tiara! Hooray for Katie! We told you you'd look good in a tiara. Odin hopes you'll take him for a spin in you new wheels! Coolio. Do you get to use Air Force One now? And congrats to Blind Cat Rescue, they are one awesome organization. We only have one question. How do we address you now Katie? Are you Your Highness, Queen, or Omniscient Ruler? Congratulations, Katie! Err...can we still call you Katie? YES WE DID! CONGRATS!!! We are so happy here for The Blind Cat Rescue, and the generosity from HALO fot the other great shelters. Hail Katie!!! and shout out to Waffles & Cathy Keisha and everyone who helped & voted. And much, much love to Homer! Now GO CRAZY!!!! This is such an amazing good news, Katie! Can we join.... We know we're not from the US but we'd love to join so PAWS of tabbycatclub and http://animalsheltervolunteer.blogspot.com/ can get a better chance of winning. Anyway, we hope that Austin becomes your next secatary of inferior... he's really good at it. OMC! So happy for you (of course, you DESERVE it, Katie), and for Blind Cat Rescue!! 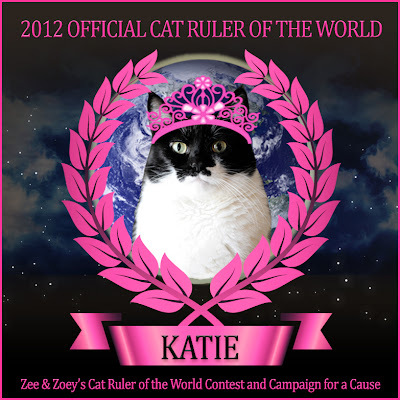 O-Ruler Katie, congrats and hugs sweetie and hooray for Blind Cat Rescue! Congratulations, Katie! You ran a great...and funny...campaign. Big kudos to CK and Waffles too! Congratulations Katie. You Rock Girl!!!!!!! We are so happy for the Blind Cat Rescue. YES YOU DID! Yea Katie! So happy for Blind Cat Rescue. 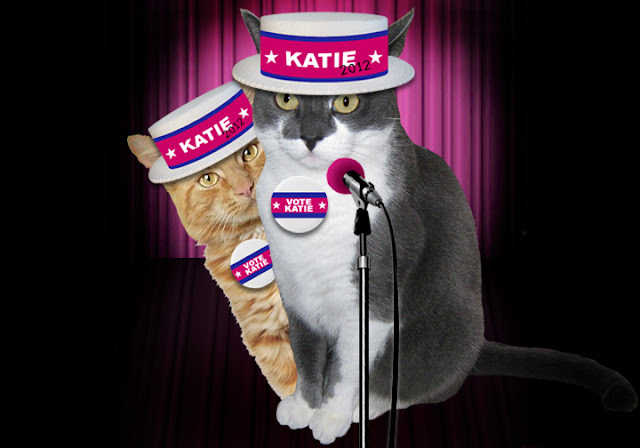 Congratulations Katie and thank you for supporting the Blind Cat Rescue. 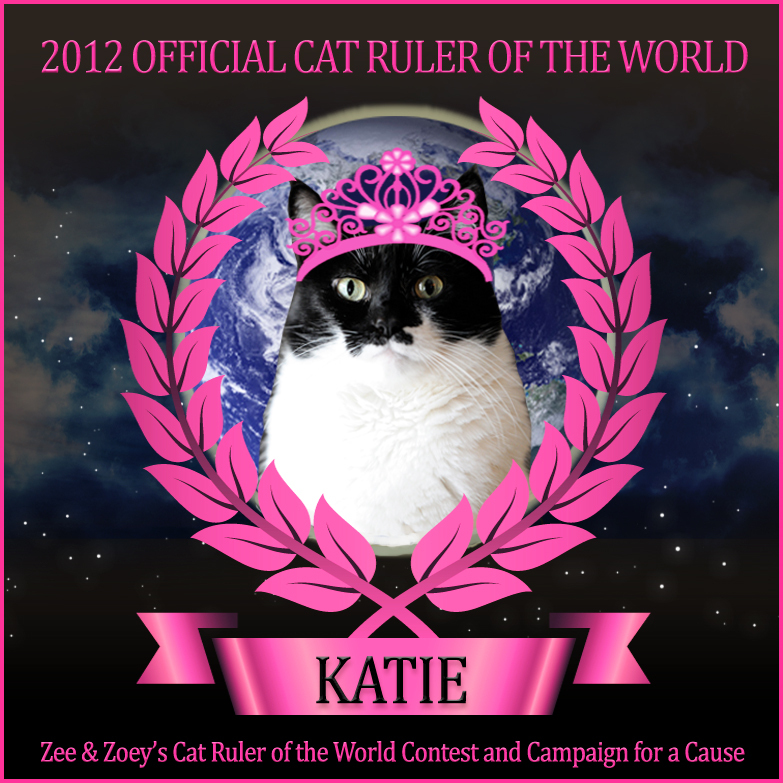 Katie, concatulations on winning the title of Cat Ruler of the World!! It was so much fun having you part of this campaign, but I think next year I will try to find cats that compliment my leopard theme better... all this pink is making my head dizzy!! You are a sweetheart (I won't tell anyone) and I thank you so much for all of the effort and devotion you put into this to help Blind Cat Rescue. Congrats to you and BCR! A big conga rats to you Katie. Well done. You had a mighty good campaign manager too. Well done. How exciting for the Blind Cat Rescue. Take care. SI SE GATO! SI SE GATO! YEAH BABY! Is it too early to jockey for the position of Secretary of State or Vice Ruler? Just axing. Let the next campaign begin. Sigh! It's always something. Anyway, just wanted to congratulate you buddy cos you did awesome and it's so great to see the Blind Cat Rescue are being helped out - this was a wonderful contest and lots of great causes are benefiting!! 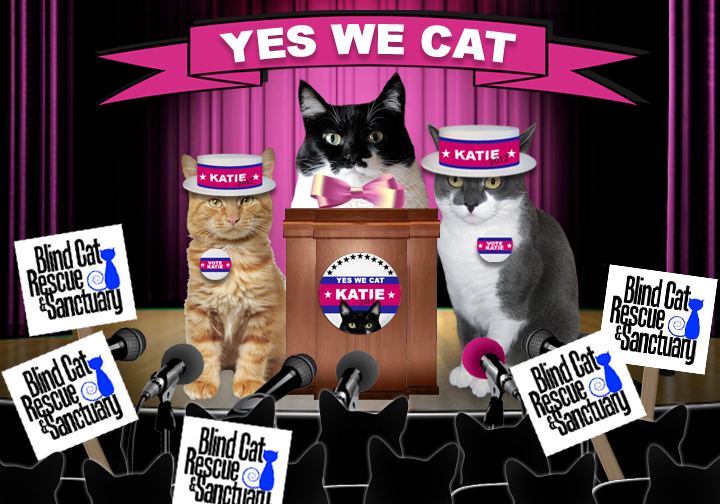 HURRAH for Blind Cat Rescue...and YOU, Katie!!! We had so much fun following the elections. Scouty would like to apply for a job--he says Under(the bed) Secretary would be purrfect for him! 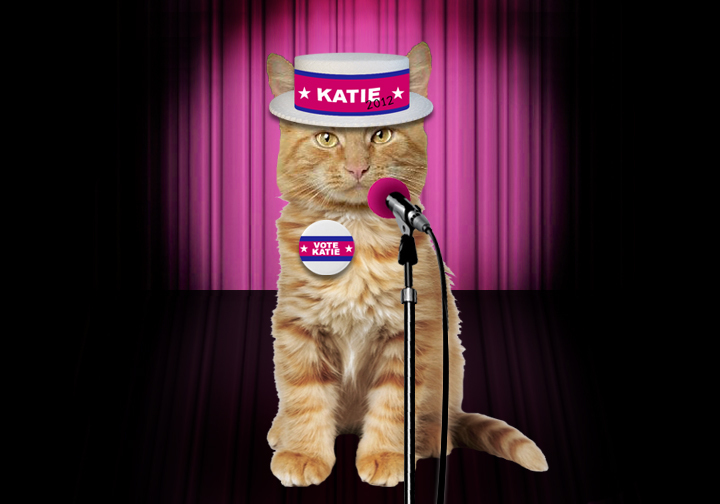 Concatulations, Katie to you and a win for Blind Cats Rescue! Congratulations to Katie! And congratulations to Blind Cat Rescue!! CONCATULATIONS on your amazing win for the Blind Cat Rescue. I am greatly looking forward to many updates as to how the kitties are doing, their adoptions etc, what fun that will be!! I do have a question that I have been meaning to ask..who in the HELL is Waffles??? MOL. ConCatulations to you and to Blind Cat Rescue!! 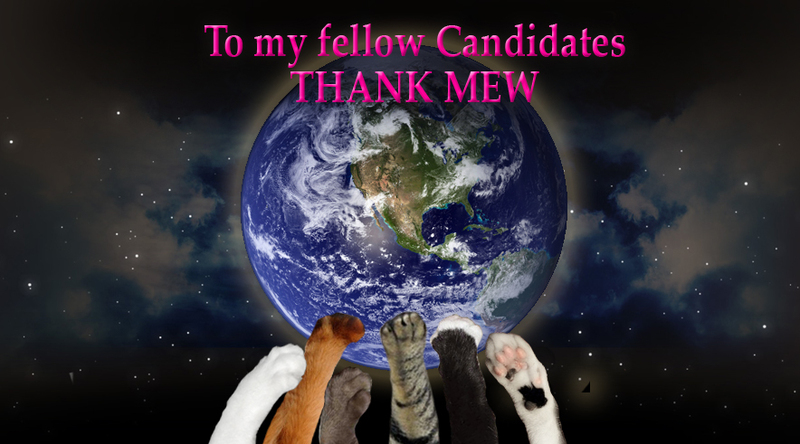 All of the Cat-i-dates ran pawsome campaigns! Hurray , Hurray , Hurray , Hurray ! Waffles and CK have sure been doing a great job with the campaigning ! Congratulations! And Cat We Can! Superb campaign and such a well deserving shelter, we are so happy for those sweet kitties! Concats, Katie! Your hard work really paid off. We think every kitty who ran was a winner. This is so exciting for those blind kitties, may God bless them. Congrats Katie, Glogirly and especially Blind Cat Rescue! Yous rocked the world and shall continue to do so! For at least a year. Me is so excited for yous! PS What is Waffles going to do now! What the heck? Where did our comment go? We left you congratulations earlier today, but our comment seems to have gone the way of the dodo! congrats Queen Katie HIP HIP HOORAY long live QUEEN KATIE! Concats on a great campaign and a wonderful result for you and the Blind Cats Rescue. Yayyyy for Katie!!! 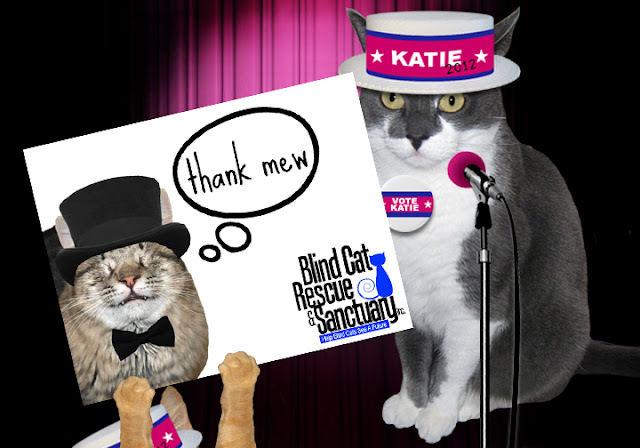 Concatulations Katie, to you, your team and of course, to Blind Cat Rescue!